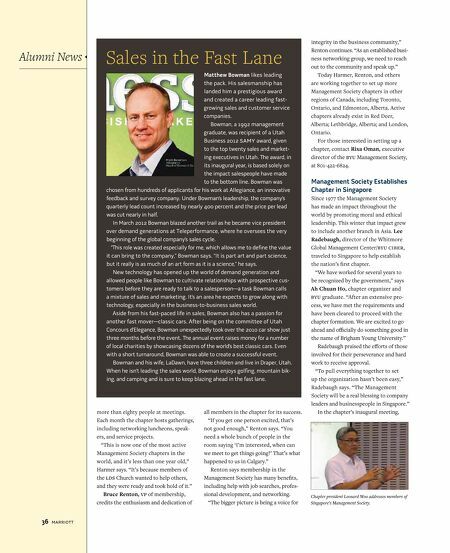 Sales in the Fast Lane Matthew Bowman likes leading the pack. His salesmanship has landed him a prestigious award and created a career leading fast-growing sales and customer service companies. Bowman, a 1992 management graduate, was recipient of a Utah Business 2012 SAMY award, given to the top twenty sales and marketing executives in Utah. 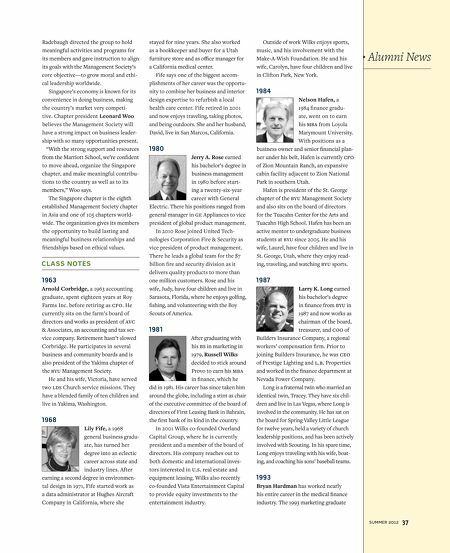 The award, in its inaugural year, is based solely on the impact salespeople have made to the bottom line. Bowman was chosen from hundreds of applicants for his work at Allegiance, an innovative feedback and survey company. Under Bowman’s leadership, the company’s quarterly lead count increased by nearly 400 percent and the price per lead was cut nearly in half. In March 2012 Bowman blazed another trail as he became vice president over demand generations at Teleperformance, where he oversees the very beginning of the global company’s sales cycle. “This role was created especially for me, which allows me to define the value it can bring to the company,” Bowman says. “It is part art and part science, but it really is as much of an art form as it is a science,” he says. New technology has opened up the world of demand generation and allowed people like Bowman to cultivate relationships with prospective customers before they are ready to talk to a salespersona task Bowman calls a mixture of sales and marketing. It’s an area he expects to grow along with technology, especially in the business-to-business sales world. Aside from his fast-paced life in sales, Bowman also has a passion for another fast mover—classic cars. After being on the committee of Utah Concours d’Elegance, Bowman unexpectedly took over the 2010 car show just three months before the event. The annual event raises money for a number of local charities by showcasing dozens of the world’s best classic cars. Even with a short turnaround, Bowman was able to create a successful event. Bowman and his wife, LaDawn, have three children and live in Draper, Utah. When he isn’t leading the sales world, Bowman enjoys golfing, mountain biking, and camping and is sure to keep blazing ahead in the fast lane. more than eighty people at meetings. Each month the chapter hosts gatherings, including networking luncheons, speakers, and service projects. “This is now one of the most active Management Society chapters in the world, and it’s less than one year old,” Harmer says. “It’s because members of the LDS Church wanted to help others, and they were ready and took hold of it.” Bruce Renton, VP of membership, credits the enthusiasm and dedication of all members in the chapter for its success. “If you get one person excited, that’s not good enough,” Renton says. “You need a whole bunch of people in the room saying ‘I’m interested, when can we meet to get things going?’ That’s what happened to us in Calgary.” Renton says membership in the Management Society has many benefits, including help with job searches, professional development, and networking. “The bigger picture is being a voice for integrity in the business community,” Renton continues. “As an established business networking group, we need to reach out to the community and speak up.” Today Harmer, Renton, and others are working together to set up more Management Society chapters in other regions of Canada, including Toronto, Ontario, and Edmonton, Alberta. Active chapters already exist in Red Deer, Alberta; Lethbridge, Alberta; and London, Ontario. For those interested in setting up a chapter, contact Rixa Oman, executive director of the BYU Management Society, at 801-422-6824. Management Society Establishes Chapter in Singapore Since 1977 the Management Society has made an impact throughout the world by promoting moral and ethical leadership. This winter that impact grew to include another branch in Asia. Lee Radebaugh, director of the Whitmore Global Management Center/BYU CIBER, traveled to Singapore to help establish the nation’s first chapter. “We have worked for several years to be recognized by the government,” says Ah Chuan Ho, chapter organizer and BYU graduate. “After an extensive process, we have met the requirements and have been cleared to proceed with the chapter formation. We are excited to go ahead and officially do something good in the name of Brigham Young University.” Radebaugh praised the efforts of those involved for their perseverance and hard work to receive approval. “To pull everything together to set up the organization hasn’t been easy,” Radebaugh says. “The Management Society will be a real blessing to company leaders and businesspeople in Singapore.” In the chapter’s inaugural meeting, Chapter president Leonard Woo addresses members of Singapore’s Management Society.